Have you ever gone across the sea to Ireland? And watch the sun go down on Galway Bay. I'm sure that once again they will be seen. Real tennis in Ireland is, if not alive and well, off the critical list. 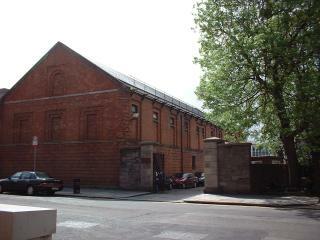 The Irish Real Tennis Association (IRTA) has managed to stave off the conversion of the only extant, roofed real tennis court in the Republic of Ireland to a recital hall. Some day, real tennis will indeed once again be played in Eire. For those of you not following the story of late, the facts: the court was built in 1885 by Sir Edward Guinness (yes, that Guinness), later 1st Earl Iveagh; it was the venue for the 1890 World Championships (Tom Pettitt vs. Charles Saunders); and it was given to the Irish State in 1939 by Rupert Guinness, 2nd Earl of Iveagh, as part of a larger bequest. 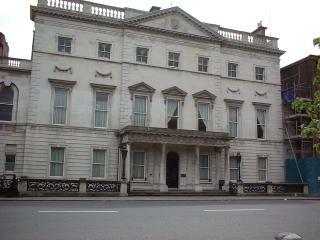 Iveagh House, opposite St. Stephen's Green, now housing Ireland's Department of Foreign Affairs. World War II intervened, and the court was closed, due to a Government decision to convey it to University College of Dublin (UCD), despite the pleas of players at the court who wrote to the Taoiseach at the time. Since then, the space has been used for a variety of purposes by the (UCD). Never a stronghold of real tennis like the U.K. or the continent, the tradition of Irish real tennis faded in memory, more fable than reality, like leprechauns at the end of a rainbow. That is now changing. St. Stephen's Green is just 25 paces to the right in this photo. The court exterior is still unmistakably recognizable to anyone who plays. Indeed, as I approached it, I was reminded of, of all places, the Hobart court, even though the court was built to the same specifications as Canford School's court. 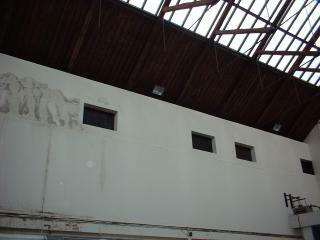 The interior is somewhat less recognizable, having suffered the loss of the penthouse roofs and galleries, but the fabled black marble floor is still there, the skylight roof, providing an abundance of sunshine even as late as 7pm, is in a condition to be envied by many courts in use today, and the vestiges of locker rooms and other features recognizable to the real tennis cognoscente remain. 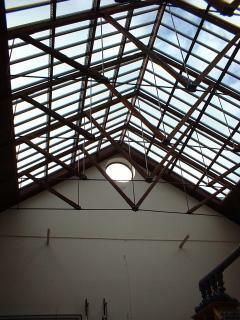 View of the skylighted roof and eyehole window, during a moment of sunshine in Dublin! View of the battery wall; lower left marks where the marker's box would be. Though one can see evidence of slight water damage, the building is in fact, quite sound. Look closely and see the seam that separates fair territory (just below the blacked out windows). I had occasion to visit this incredible court on a recent trip to Ireland. Though it rained every day I was there, I must confess that the trip was a delight. As a wise man who lives on a mountaintop recently told me, "there is no bad weather, only bad clothing," never more applicable than for Ireland in May. I heartily recommend a trip to Ireland and soon there may be one more reason to go. The Guinness court is truly not more than 25 paces off St. Stephen's Green, the geographic heart of the culturally and socially vibrant city of Dublin. Ireland continues to enjoy a vigorous economic boom; everywhere there are signs of the "Celtic Tiger." For devotees of real tennis, Dublin, Ireland promises one day to be a great destination for a real tennis holiday. To begin with, Dublin is "doable" in a long weekend; the flight is shorter than to anywhere else in Europe. When you arrive, you can play "tourist" in a day and a half (with some energy) visiting the multitude of historical, cultural, and artistic sites and exhibits, shop for traditional Irish wares and unique Celtic arts and crafts, and at the end of your day, have your pick from multiple choices in world class dining and myriad hotels in every price range. The euro is the national currency; U.S. dollars are also accepted in most locations. I stayed at the Shelbourne Hotel, on the opposite side of St. Stephen's Green, and enjoyed their five-star restaurant, as well as their legendary (deservedly so!) afternoon tea. Don't miss the tea, and be sure to arrive hungry! You won't leave that way. Outside of Dublin, for the truly intrepid with an historical interest in real tennis as well, there is an interesting ruin of a real tennis court made more romantic by its sheer inaccessibility. This curiosity is located on an island several miles off the coast, in the Irish Sea, and reachable only by private boat. I really have no idea of how to get there. 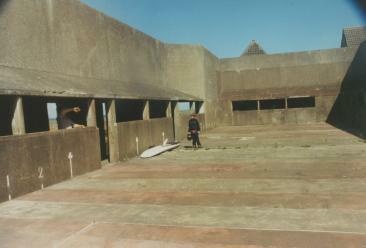 The Lambay Island court was, or is, like Falkland Palace in Scotland, an open air venue. It has one-of-a-kind architectural elements, even for real tennis, for example, on the hazard end, unique penthouses set in the MAIN wall to the left. Windsurfers storing their equipment at Lambay Island. The unique shot that this allows from the service end is off the main-wall penthouse angle across to the winning gallery. The angles are so arranged. The connection of this court to several U.S. courts is strong, Lorillard being perhaps the most recognizable family name. 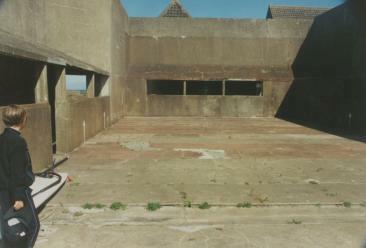 Lambay may be the fairy tale, but the Guinness court, owned by the Irish State, feasible to restore, located within easy commuting distance of 3/5 of Ireland's population, and ideally situated for international visitors, is the real deal, and represents the only feasible means to return real tennis to Ireland. When the UCD vacates, the path will be paved for a capital campaign to restore the court. More information about the Guinness court will be sure to follow. In the meantime, if you have any questions, please contact me at smreil@aol.com. If I cannot answer them, at least I can try to put you in touch with someone who can.